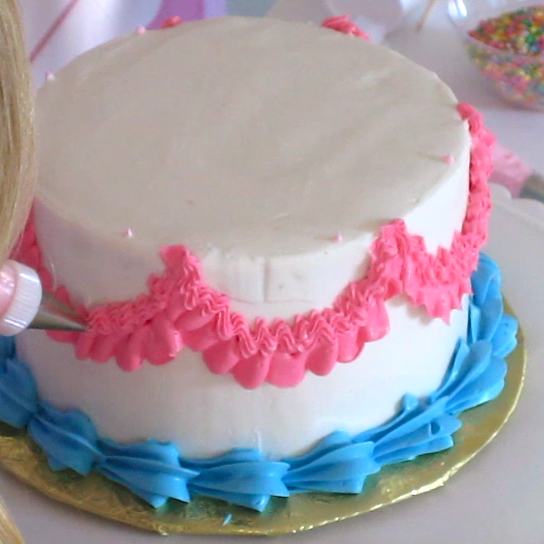 Today we finish my cake decorating 101 series with a fun party cake decorating tutorial. 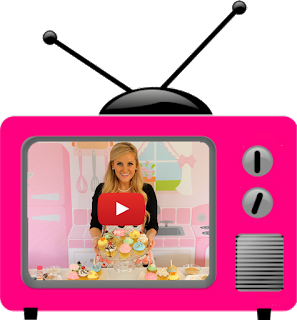 I've tackled the cupcake decorating on my youtube channel and since you guys were asking for some cake decorating videos, I created a whole three part series! 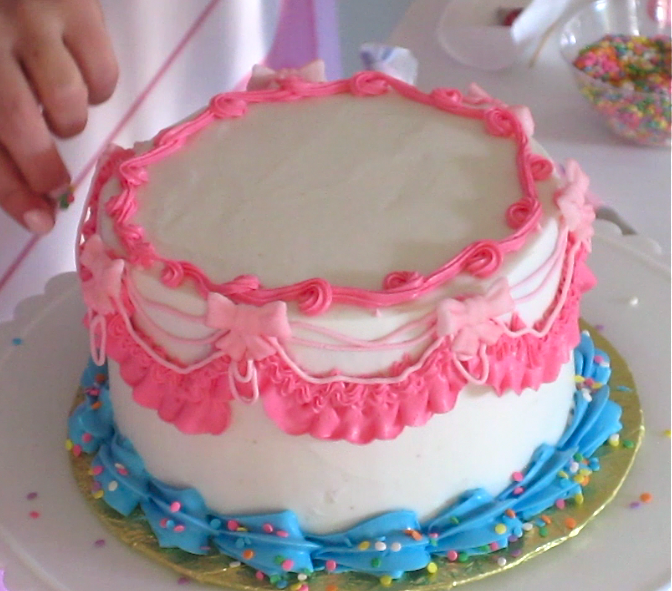 The videos will show you how to to make a beautiful layer cake from start to finish and this is the first one to get your started so don't forget to subscribe to me channel to be the first to see the new videos! 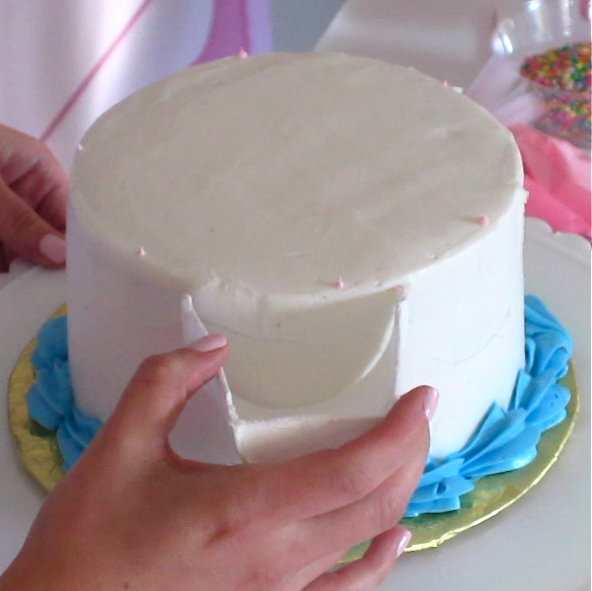 There are a ton of different ways to decorate a cake, today we master the shell boarder and some fun piping accents... Go with a simple technique by adding some sprinkles and a fresh strawberry to a basic top and bottom boarder. 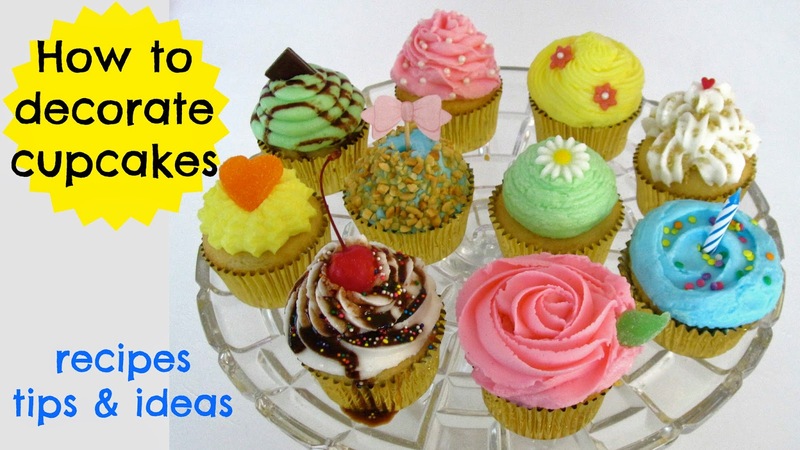 You can use different piping tips to create different looks like little rosettes and drop strings, with sugar pearls and sprinkle leaf accents. Here is a mix of basic techniques, using the star top to make a rainbow and a round tip to pipe clouds and create letters. 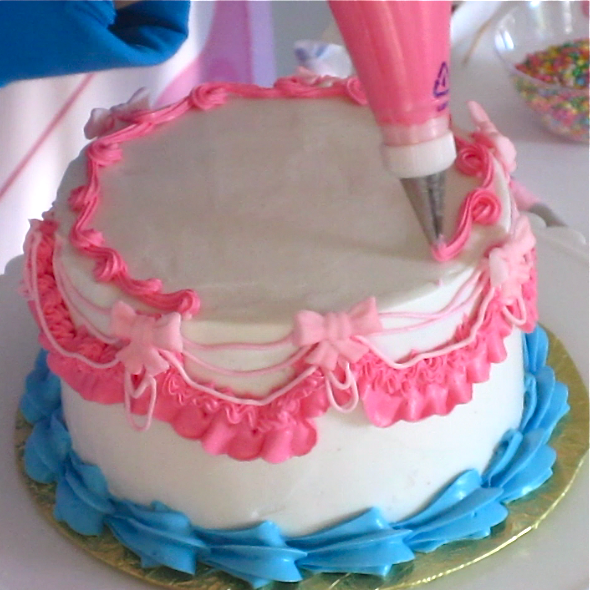 Sprinkles are added for a pop of color. 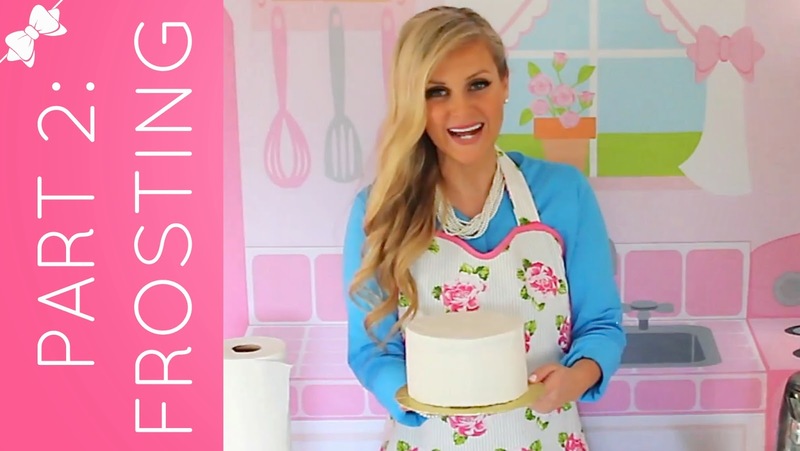 If you want to use candy or fondant to make roses, instead of trying to pipe them, just add a simple shell border and check out my step-by-step video tutorial for making rose cake toppers! 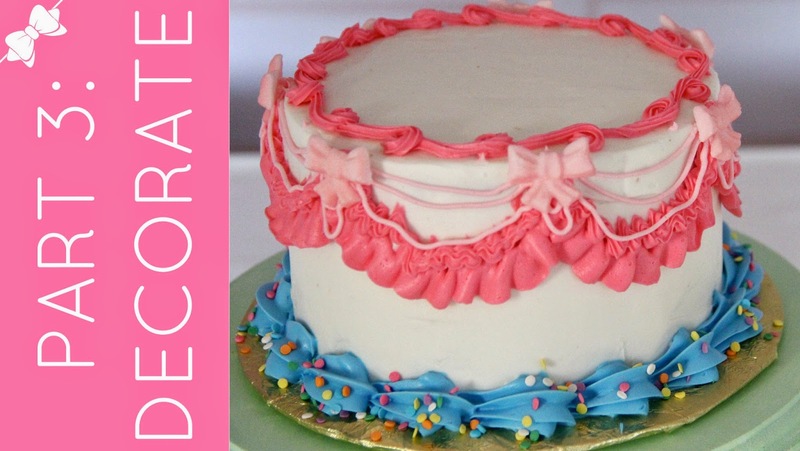 Today I use a combination of classic shell boarders, drop strings, fancy piping techniques, pre-made decorations, sprinkles and more! 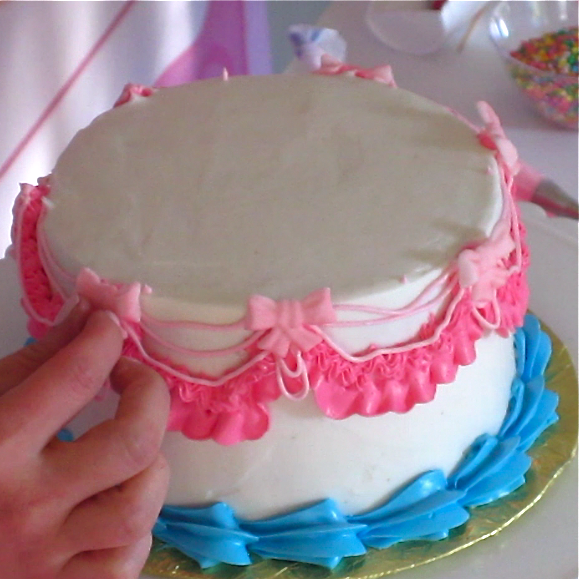 First thing you need to do to decorate this type of cake is make a batch of my perfect buttercream frosting for decorating. 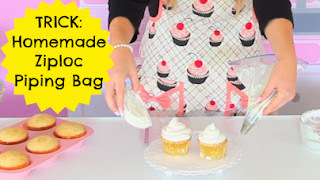 It only has a few ingredients and is much different than canned frosting you buy from the store because it holds its shape when you pipe it, instead of drooping into a soft mess. 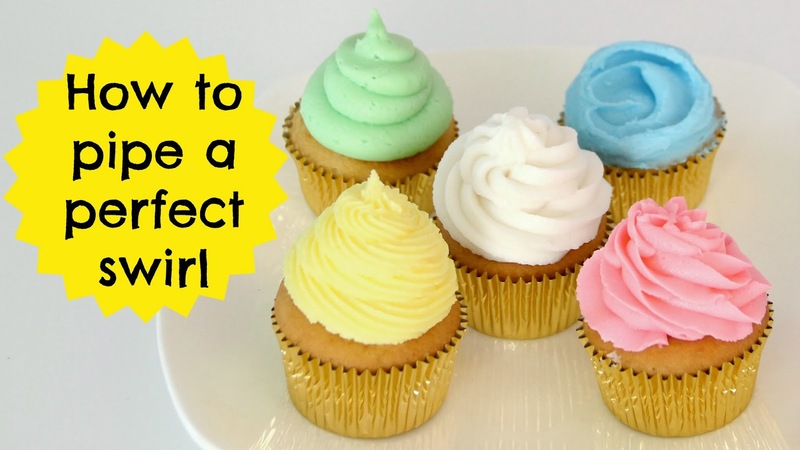 With an electric mixer, beat butter or shortening on medium speed until smooth. Add vanilla and salt. Alternately beat in powdered sugar and cream, on low speed until smooth. 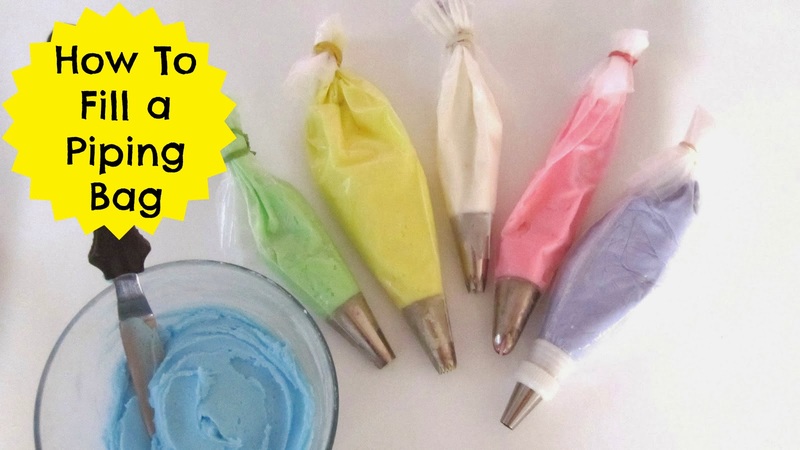 Add food coloring and increase speed to medium-high and beat for about 3-5 minutes until light and creamy. I start by making a classic shell border, You can use any size star tip for this depending on how big you want your border. A trick to create guidelines to pipe on top of, is using a styrofoam cup cut in half. 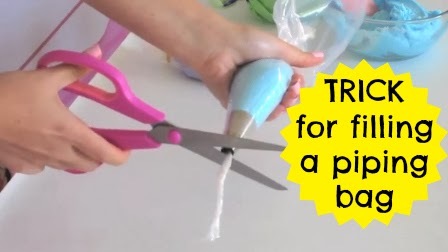 It is flexible so you can create a U shape for piping over, as narrow or as wide as you like. 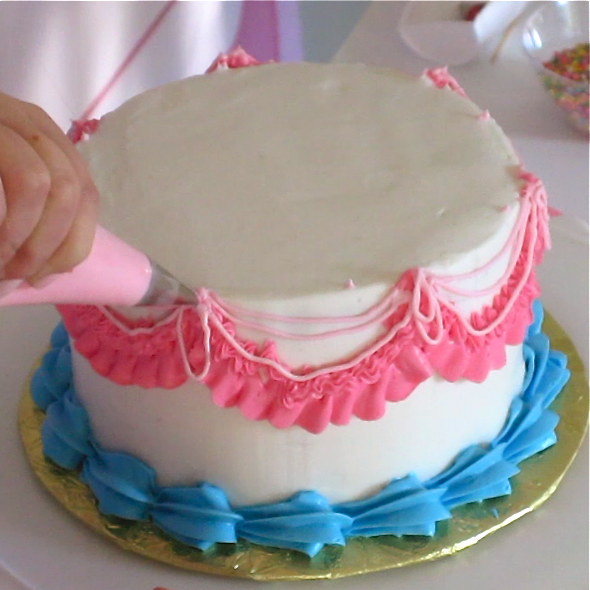 I start with a ruffle swag using a rose petal tip, with the wide end pointing upward, applying pressure as I move my hand in an up and down motion. I did the same technique using a small star tip, right on top of the ruffle. 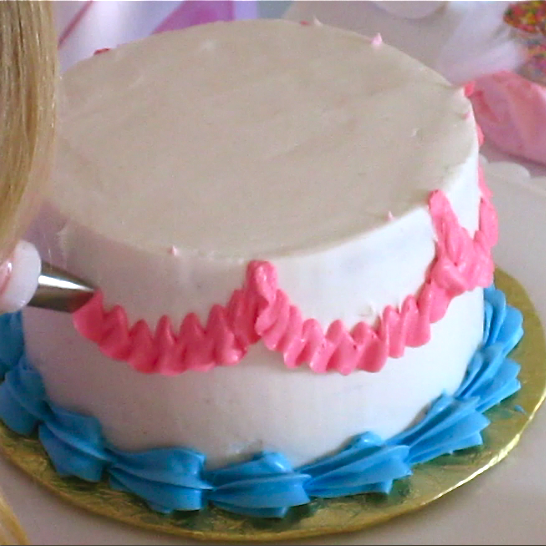 Here I am using the Wilton #16 tip. I then took a Wilton #2 small round tip to pipe drop strings and little loops, in a light pink to give a pretty accent. 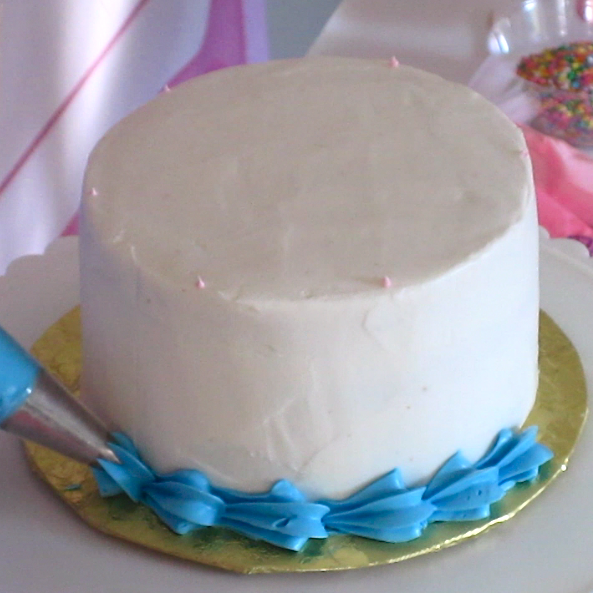 I then added some sugar decorations for a fun finishing touch. Using the #16 tip, I did a top border to finish everything off. 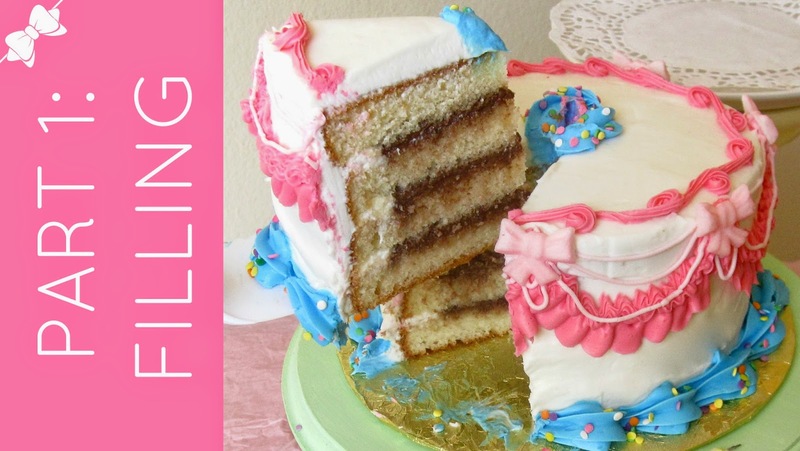 A little pop of color with some confetti sprinkles, finishes off the cake. 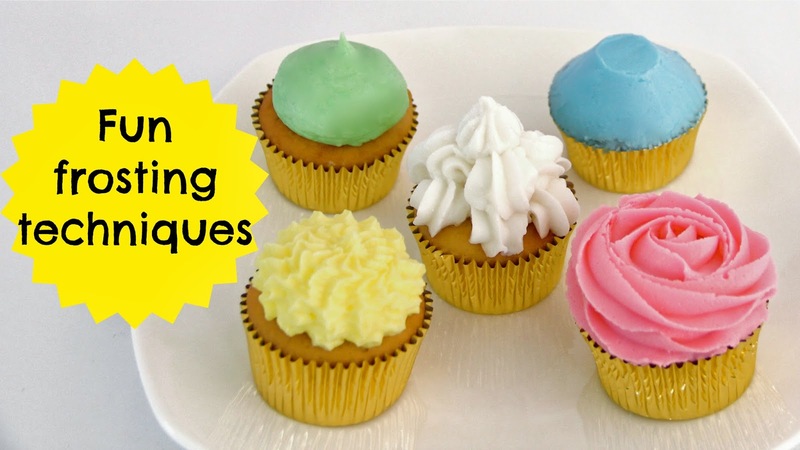 Use any combination of decorating methods you choose to create your own custom party cake, perfect for birthdays, celebrations or special occasions! For more tips and tricks click the links below!